Every year since my budding adolescence, the cold winter air brought with it my yearly sinus cold. For weeks, I’d be so tired and stuffed up. As I got older, I got sick more frequently. Soon, my nose was stuffed year-round. I was always stuffy, always tired, always getting sick. The majority of the time it was bearable. I thought that this was “just how I am”. How many times do we tell ourselves that? It’s as if it is no use trying to change something that we are unhappy with because it can’t change. After years of this limiting self-talk, I learned a long-awaited lesson. It can change. By “it” I mean whatever is causing discomfort or unhappiness. There’s always the chance that what we do won’t change things, but you never know until you try. And if it doesn’t work, get back up and try again. When I got sick from the mold in my house, I totally revamped my life to deal with the inflammation and gut irritation I was experiencing. It was a few months into my new way of living that I realized that my nose was always clear and my spring allergies never came. When fall came, my sinus cold never did. I could be around people with the nastiest colds and never get so much as a sniffle. If I did feel something coming on, I’d make myself a quart of green juice in the morning and get a good sleep. I was managing my stress very well at the time, so I didn’t have to worry about that affecting my immunity. Thank goodness because worrying about stress compounds the problem. It would have been nice if my stroke of luck continued forever, but life happens. No one is 100% immune to getting sick; no one is perfect. We can’t always live a stress-free life with the best diet ever. My diet, while healthy, is not where I’d like it to be in order to feel my best. Much to my chagrin, stress has been getting the best of me, and my sleep patterns are irregular and often restless. So, when I spent 5 days away from home with 2 very sick folks, I fell ill. And boy did I fall hard. My adrenal fatigue symptoms, many of which had long subsided, came back with a vengeance. They were honestly more difficult to handle than the cold was. It lasted a little more than a week, but I couldn’t believe that I used to endure these colds all the time because “it’s just how I am.” I didn’t used to have the crippling effects of adrenal fatigue, but even so, why didn’t I do something about this before! This time around, I didn’t eat processed comfort food, take pharmaceuticals, or push myself to do tasks that would use what precious energy I had left. I was proactive and treated myself with the kindness I deserve. Some things that helped were..
Rest: I went to bed early, slept as late as possible, and took naps when I felt the need. Hydration: I drank lots of water, herbal tea, and green drinks. I added lemon for vitamin c and for it’s antiseptic properties. Nutrition: I ate only when hungry, I ate mostly fruits and vegetables, and I steered clear of mucus-forming foods. Multivitamin: I wasn’t eating a lot, so the multi was good nutritional insurance. Assistance: Don’t be a martyr. Ask for help. My partner handled the chores, meals, and dog walks allowing me to relax and not stress about doing things I had no energy for. Ginger tea: Like a drink straight from the heavens, this was my elixer of life. Hyperbolic, but so true. 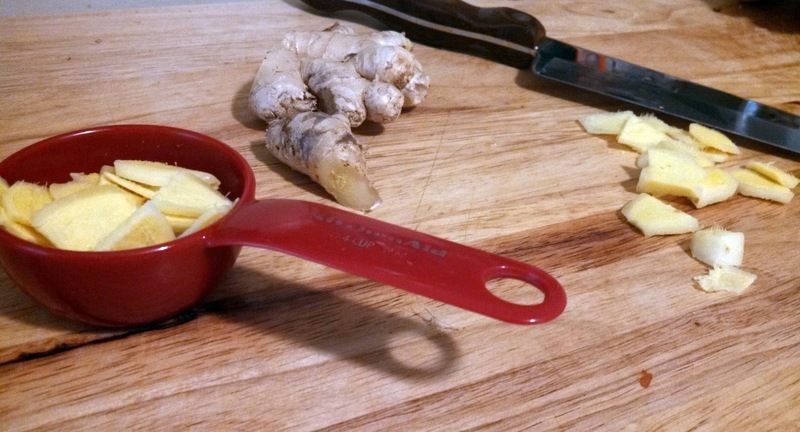 Ginger tea is a fabulously soothing drink. You don’t need to (and shouldn’t!) wait until you’re sick to make this. It’s a great beverage for any occasion. I peel my ginger only because the peel comes off and floats in the tea. 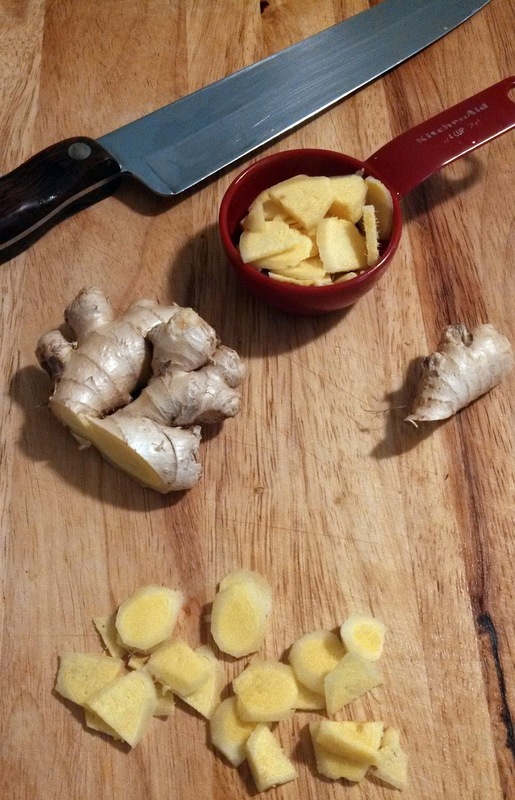 If you don’t mind the extra step of straining the tea after you’re done, you can chop the ginger as is. I also use stevia in this recipe to sweeten the tea. It reminds me of the sweet ginger tea I used to drink at thai restaurants. Sugar is especially harmful to the body in times of weak immunity, so I wouldn’t recommend using sugar (or maple syrup, agave, coconut nectar, etc.) in this recipe if you are sick. -Peel and slice the ginger. -In a pot, bring water and ginger to a boil. -Simmer covered for 20 minutes and then turn off the flame. -Stir in stevia and then cover the pot again. -Let the tea sit for 15 minutes or more, allowing to brew a little bit longer. -Squeeze the juice from ½ a lemon into a large teacup and add ginger tea. -Store leftover tea (with the ginger pieces) in a glass jar. It will stay good for several days.